The Art Institute of Phoenix is a degree-granting institution in Arizona that focuses on developing professional skills in the fields of animation, visual effects, game design, fashion design, and culinary arts. It's part of the Art Institute association of schools, which has over 40 branches throughout North America. I visited the school more than a year ago, and I've also visited the Art Institute Inland Empire in San Bernardino, California. 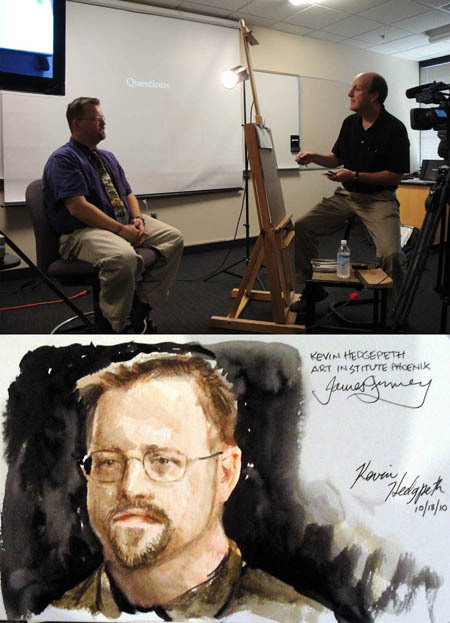 Kevin Hedgpeth is on the faculty of the media arts program. He's showing me paper sculptures of a helmet and a motorcycle made by the students. Kevin has experience in illustration, toy design, character design, and paleoart. He likened his job as an instructor to giving the students a "Batman's utility belt," with a variety of skills that they can use in an ever-changing job environment. After touring the building, meeting faculty, and doing a digital presentation, I did a demo portrait of Kevin. That's My old School. Class of "03"
Glad to see Kevin is still there. He was a huge source of inspiration and motivation to me while I attended. He hasn't changed a bit. Nice, I'm actually attending the school in the Inland Empire hopefully you can make another trip out here in the future. It was a great visit, I really got a lot out of it. Thanks for making the drive across the desert! If James ever visits nearby you, I highly recommend going. Wow, where did Kevin get that great tie? I don't think I've ever heard of paper sculptures/models...at least not like that motorcycle. How in the world does one get tires like that out of paper? I currently attend AiPX! (about to graduate, actually). I remember when you visited the school. I learned so much from your panel. I like the way you are making things easier to do. As a real novice in blogging, getting this type of help is wonderful.Thanks for showing us new ways to do things!